Retinal hemorrhage is basically blockage and rupturing of blood vessels of the retina. Retina is the membrane which receives light from opening of iris and only this membrane is responsible for the vision as it receives light and convert them into nerve impulses and these nerve impulses are converted into visual images by brain. Retinal membrane is present at the back side of eye. Retinal membrane contain rods and cones which are responsible for the colors of vision and are light sensitive. In retinal hemorrhage, bleeding occurs on retinal membrane and as a result affect vision. A dense network of capillaries is present at retina and blood supplied to it via retinal arteries and blood taken from it via retinal veins. When any kind of injury or disease happen to retina it leads to rupturing of blood vessels and as a result bleeding occurs and it ultimately it effect vision (person can’t see accurately). Loss of vision may be temporary or permanent. High blood pressure and diabetes are the diseases which can cause retinal hemorrhage. So these diseases should be regularly monitored to avoid any kind of injury. Can occur in infants due to shaking or blows to head. The causes of retinal hemorrhage vary with age. In adults the causes are simple and easy to understand. Diabetes is the most usual cause along with uncontrolled hypertension, these both diseases should be controlled on time. Due to leakage of blood in retinal hemorrhage the vision is effected so the patient may have blurry vision or may lose complete vision. The eyes may appear red. Damaged retina show spots and floaters. There may be red tint in vision. In the peripheral vision, there may be flashes of light. Often patients complain of loss of vision in morning and then after some time it becomes normal and the patient can see clearly everything. Subhyaloid and preretinal hemorrhages: It is present between the internal membrane and vitreous base posterior. To find out difference in these two types is very difficult. In this hemorrhage the blood flows freely. Flame shaped hemorrhages (NFL hemorrhages): As the name indicates it is located within NFL and it resembles the shape of flame due to axons of ganglion cells. 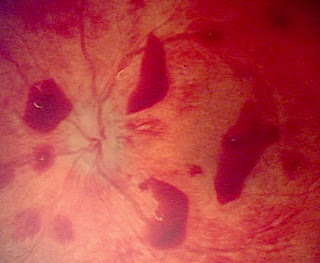 Dot-and-blot hemorrhages: It is present between retina inner nucleus and outer layers. Sub retinal and sub retinal pigment epithelium (RPE) hemorrhages: It is present under neuro-sensory retina. Treatment of Retinal Hemorrhage depends upon etiological factors on which it happens. For example if it happens due to diabetes or hypertension then treatment of primary cause is necessary otherwise it is difficult to prevent further Retinal Hemorrhage. Similarly, degenerative disease may cause Retinal Hemorrhage, trauma to retina, mechanical injury, extreme heat exposure are main etiological factors. Initially, vasoconstrictors in the form of eye drops are recommended to restrict further loss of blood.